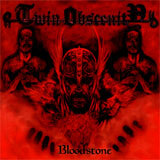 Twin Obscenity exists since 1991 and Bloodstone is their third cd. The first cd Where Light Touches None was released in 1997 by Head Not Found records and the second one For Blood, Honour And Soil in 1998 by Century Media. The band is actually a trio but they were joined by two singers, including a female vocalist called Tonje Ettesvoll. So once again a band from Norway which plays dark and gloomy stuff. Twin Obscenity's style goes from Doom-Death to Viking / Black and even sometimes Epic Metal, in other words a big melting pot of different kinds. The result is a bit strange : I'm warning you, so you'd better be open minded, because I know that some purists in this branch won't like all these mixes. Anyway the production isn't that bad and the result of all these mixtures of Scandinavian specialties are very surprising, so now it is up to you for the final judgment. How many bands will come out of Norway ??? It is just amazing to see how the scene is creative there. The word creative is a good one to describe Twin Obscenity anyway. You can't get blood from a stone, but you can be surprised by Bloodstone.